New Delhi : Keshavpuram District BJP workers staged a demonstration at the office of NDPL in Shalimar Bagh today to protest against 6 percent hike in the power tariff. The workers were led by Pradesh BJP General Secretary Smt. Rekha Gupta and District President Shri Sanjeev Sharma. Councillors Shri Chandi Ram Chawla, Smt. Mamta Nagpal, former Councillor Shri Harbans Lal Uppal, District Secretary Shri Virender Goel, Mandal President Shri O.P. 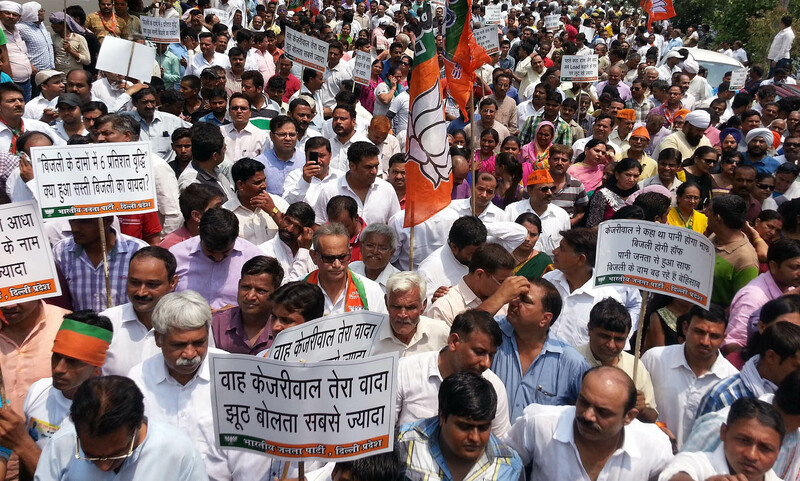 Saxena, Shri Surender Singh along with large number of workers participated in it. Addressing the demonstrators Smt. Rekha Gupta said that this hike has been made with the connivance of Delhi Government because these so called private discoms are in reality joint discoms of Delhi Government and private companies. She said that the benefit of the hike reaches to the Delhi Government and coffers of the ruling party along with the private partners.